Tips and Complete Guide to Choosing a Carpet for Your Room - Looking for a cool idea for home or living room decorating? Carpets can be one of the not only attractive decorating solutions but also has many useful functions. For those of you who want to have a new carpet as a complement to the room, would be confused determine the choice. Both in terms of color, materials, functions, size, until the arrangement can be a challenge that is quite troublesome. But do not worry. This time we will review the complete decor of this cool floor so you will not be mistaken in choosing the carpet for the room at home. Let's see the complete guide to choosing the following room carpet. Carpets can provide a tranquil and warm effect on a room thanks to the nature of the material that can be absorbed or absorbed, so it can lower the room noise and increase the temperature of the room (conductor). In addition, the carpet can also be as an insulator, where the carpet material can absorb heat so that the room becomes cool and cool even when the weather is hot. This means the carpet is a complimentary room that is not temperature dependent and is suitable to use anytime. Like other home accessories, carpet trends are also changing from time to time. In principle, the trend of carpet depends on three main factors namely color, comfort, and texture. As homeowners, the choice of carpets back again to their respective tastes. However, neutral color trends are always a favorite, although convenience and texture are also priorities that are tailored to the theme and desire of each. Similar but not the same, mats, carpets, and rugs have a slight difference in material or material terms. Mats generally use wicker materials such as rattan or pandanus. The carpet is made of a mixture of wool, polypropylene, nylon, and so on. 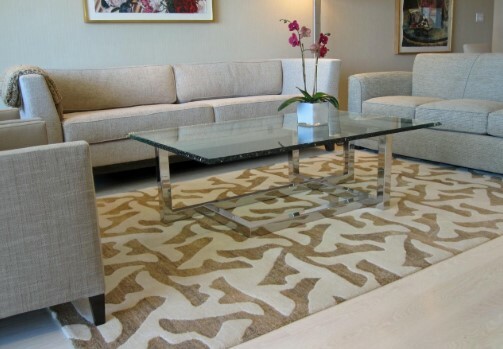 While rugs use luxurious materials such as wool or silk with a beautiful pattern of colorful. In terms of size, mats and rugs are more easily stored and held when needed, while the carpet can cover partly up to the floor of the room. Well, after mastering the general points just described above, it's time to start some important considerations in choosing a carpet that suits your needs. Selection of carpet quality depends on several factors, among others. How Often The Room Is UsedEvery room in the house has a different frequency of use. For example in the living room is only used occasionally to receive guests, you may consider the selection of medium to a low carpet. Conversely, if the room is a home activity center such as family room or gathering place, of course, the quality should be better selected and wear resistant. Rooms that have access to open activities are not recommended to use low-quality carpets because it will be quickly damaged by external factors such as solar heat to dirt from the outside. The color of the bright carpet is more suitable for decorating function and gives the effect of the bigger room. While the color of the dark carpet is more suitable for large rooms and are often used to give the impression of warm and comfortable. Also, make sure the carpet color selection is adjusted to the lighting conditions in the room. The room that has bright lighting will show the original color of the carpet more and more striking, while the room is minimal lighting will actually make the carpet color darker than the original color. Surely you have to match the color of the carpet with the overall theme of the room in order to complement each other and give the impression of a good one. When choosing, try to keep the carpet can stand out but not impressed tacky or too other than the theme of the selected room. is a natural material of sheep's animal hair and is classified as an expensive material. Therefore, the carpet of natural wool is quite difficult to find because it is now often mixed with nylon or other fibers. Wool is smooth, luxurious, and suitable for children because it is hypoallergenic (not easy to cause allergic reactions). Disadvantages of wools other than expensive is rather difficult to clean, especially light-colored. In addition, the woolen carpet is also heavier and requires careful care. This synthetic carpet is often found in home supply stores and is one of the favorite ingredients that have many advantages, such as wear resistant, relatively affordable, not easy to dirty, and easy to clean. In addition, nylon is also anti-static so it is suitable for use by anyone in various rooms. The surface of a good nylon carpet can also be straight back to its original shape after being occupied or used. It is a bit difficult to distinguish between nylon and polyester synthetic carpets. Both of these materials are the main materials that are often used for household rugs. Polyester has all the same advantages with the above nylon. The price of polyester carpet is usually cheaper than nylon carpet. amun wear resistance polyester carpet lost compared to nylon. Polyester rugs are not as flexible as nylon rugs with a surface that is more rapidly damaged and not as nice as nylon.Though these 3 materials are common, the creation of carpets by local craftsmen is also very varied with materials that are more comfortable and suitable for use in tropical countries, such as canvas, foam, weaving, genuine and synthetic fur, from wood. Soft, affordable, minimal maintenance but wear resistant - it is some of the dominant features of the canvas that make it the ideal carpet material. Choice of carpet from Stiletto In Style such as Tribal Chocolate is a light carpet choice, not slippery, and safe to use for the activities of children in the room. If the carpet will be placed in the middle of the room, make sure all the main furniture such as sofas and tables to fit into the carpet space. If the furniture is too big to be loaded in your carpet, just 2 feet ahead of the furniture that goes into the carpet space. Finally, if there are no rules in the arrangement of furniture, carpets are generally placed in the middle of the room without any specific restrictions. After studying this complete guide, surely you have increasingly got a picture of what a dream carpet that really fits and does not make bored. Some other deciding factors such as price and style can also be tailored to your personal condition and desires. Do not forget to glance at the choice of carpets by Qlapa craftsmen who must be very varied in terms of materials, colors, and patterns without having to be expensive!